For this image I was experimenting with sounds and how I could illustrate the sound of a squirrels warning call. 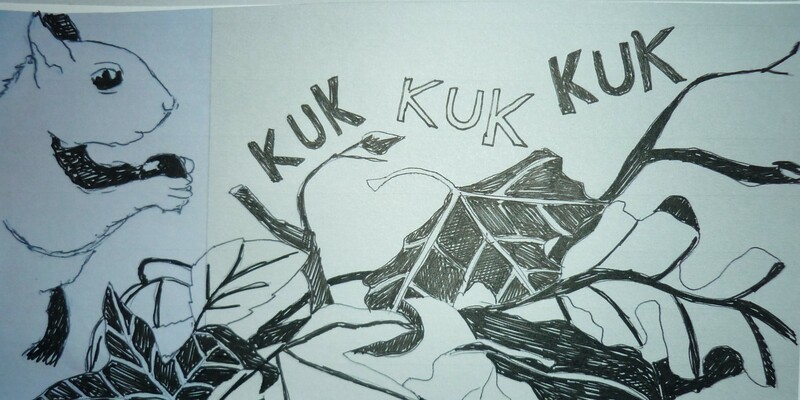 Making the K quite thick to show the power the letter is forced out when pronouncing the word. I experimented with black and white to see if it gave a more dramatic effect, instead of using colour which can soften an image. I like the black and white effect but I would want to experiment further to get the best results from using just two colours. I want to tryout this technique out with the other animals as well and mix it up in the story board to see if it enhances particular moments. 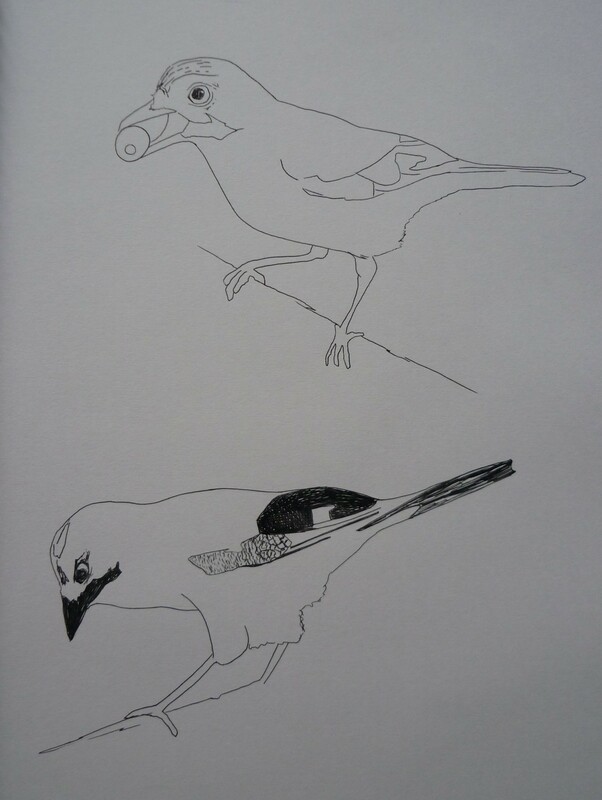 Next are the sketches of a British Jay, I have just used fine line to create these images as I am going to photograph them and print multiple copies where I will experiment using various materials and colours. 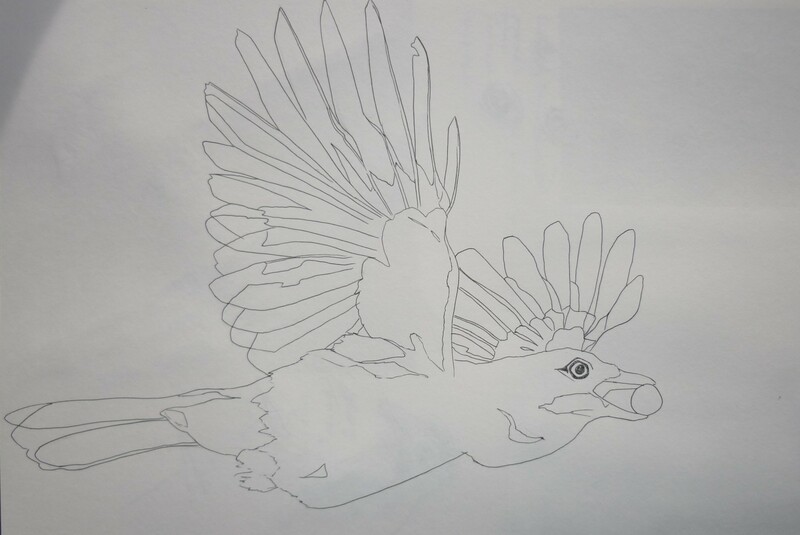 It allows me to have a base of which I can work from and I can go back to the drawings for reference on the bird. I chose various positions as I didn’t want the standard standing side profile which I think is predictable and boring when placed in a children’s book. Flying away with an acorn in it’s mouth, a beautiful freeze frame shot where all the individual feathers are clearly visible. When experimenting with materials I will be able to play with light and texture to see if I can create a sense of individuality of the character. I feel like I have been working quite slow recently but it is because I am in unknown territory which makes me question everything I do. I have created some other work but I think I need to step it up a gear and really focus on what I’m doing as time passes quite quickly. So the plan for the next week is to experiments with colour and materials on the photocopied drawings and apply the same techniques to the squirrel character. Hopefully by the end of the week I will have a good body of work which I can then work from to create the book scenes.